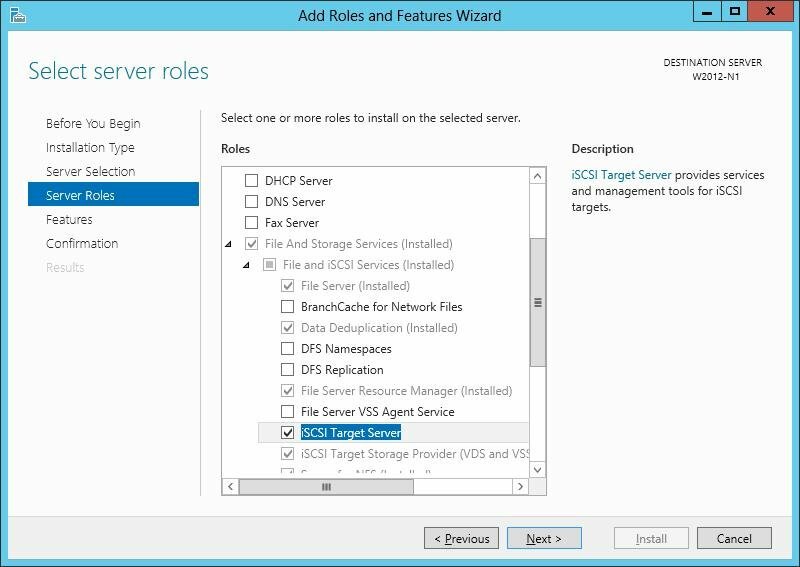 In Windows Server 2012, admins can configure iSCSI Targets using the Server and Failover Cluster Managers and PowerShell cmdlets. Here's how. is cluster aware. This allows you to serve local or shared storage in the form of virtual hard disks (VHDs) to clients across your network with your existing networking infrastructure. Using iSCSI Target can mean reduced data center costs. 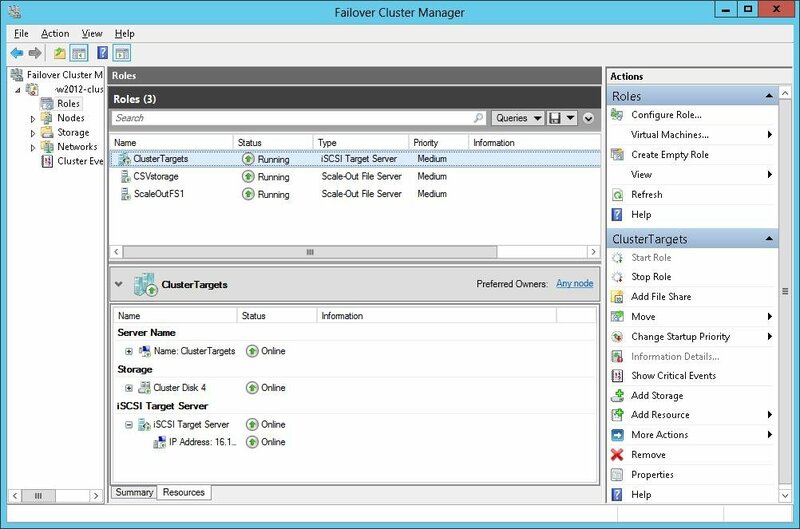 This tip provides guidance with configuring iSCSI Targets in a Windows Server 2012 Failover Cluster environment by using the Server Manager, the Failover Cluster Manager and PowerShell cmdlets. After you install the iSCSI Target Server role, you will see a new service running called the Microsoft iSCSI Software Target. 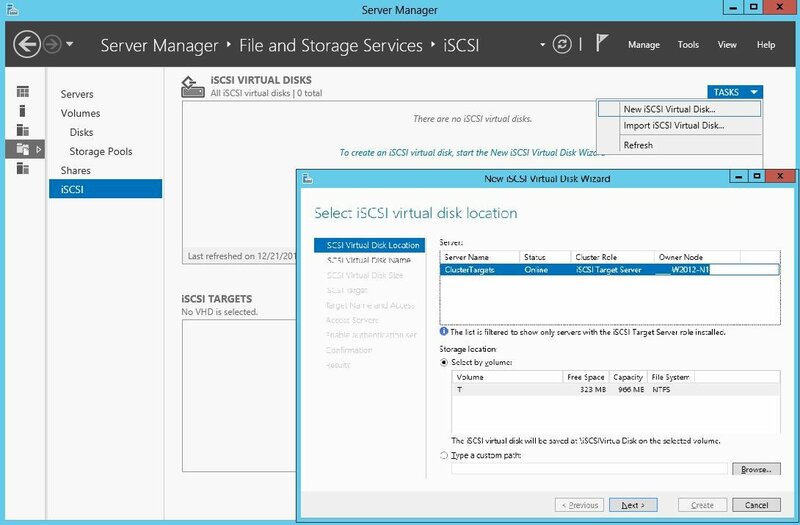 You may also see a service called the Microsoft iSCSI Initiator Service, which starts the first time you use the iSCSI Initiator control panel applet on the client-side to connect to virtual iSCSI LUNs served by the iSCSI Target Server. In our configuration, the iSCSI Target Server will be a highly available virtual iSCSI Target Server running on a Windows Failover Cluster. The next step is to make the iSCSI Target software aware that it is being used in a failover cluster. 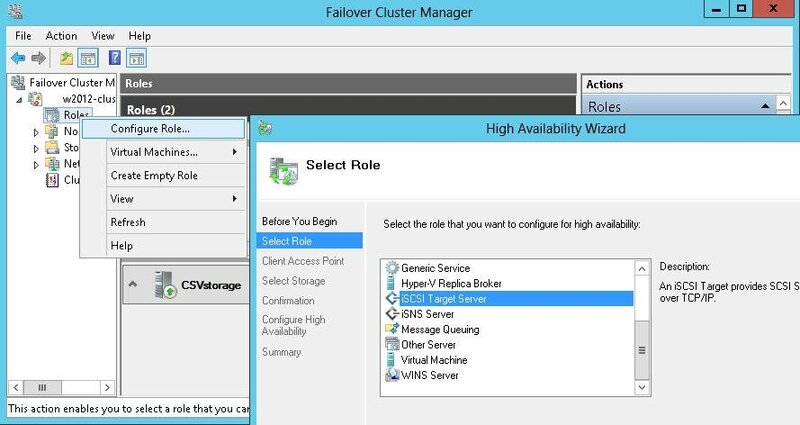 To accomplish this, you can use the Server Manager's Tools pull-down menu to select the Failover Cluster Manager. A new failover cluster role can be created by right-clicking Roles in the left-hand pane and selecting "Configure Role..." (figure 2). This only needs to be done once on the cluster, unless you need to configure multiple iSCSI Target virtual servers with their own storage. 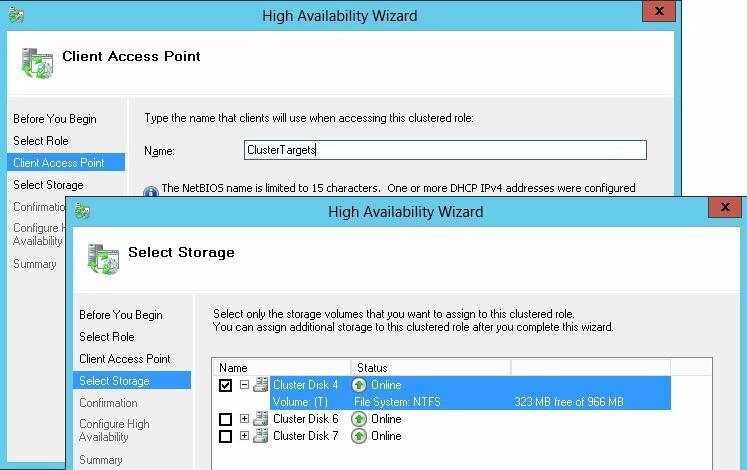 PS C:\> Add-ClusteriSCSITargetServerRole –name ClusterTargets –Storage "Cluster Disk 4"
The resulting cluster role can be viewed by selecting Roles in the left-hand pane, then selecting the new iSCSI Target Server role in the middle pane. This will display the details of the various cluster resources associated with the iSCSI Target Server role (figure 4). The remainder of the configuration is performed in the Server Manager by expanding File and Storage Services in the left-hand navigation pane, then selecting iSCSI. The upper right-hand pane will reveal any virtual iSCSI disks that have been configured or allow you to create or import new ones. The lower right-hand pane allows you to create iSCSI Target names that can be associated with the virtual disks. During the process of creating an iSCSI virtual disk (VHD file), you will be prompted for the disk location of the cluster iSCSI Target Server you just created (figure 5). You will then be prompted for the name of the virtual disk and the size. Next you will be prompted for the name of the iSCSI Target that you would like associated with the new virtual disk for discovery purposes on the client. Finally, you will be prompted to add the iSCSI initiators addresses (clients) that will be allowed to access the virtual disk. Alternatively, there are a variety of iSCSI PowerShell cmdlets that can be used to create and map virtual hard disks. For example, the following cmdlets can be used to create a virtual hard disk and map it to a new iSCSI Target called Win2012Target and allow clients with IP addresses 10.0.0.1 & 10.0.0.2 access to the drive. PS C:\> Add-iscsiVirtualDiskTargetMapping -targetName "Win2012Target"
On the client side, all you need to do is to use the iSCSI Initiator applet in the control panel to connect to the DNS name or IP address of the iSCSI Target server you just created. Then use Disk Management to bring the iSCSI LUN online, initialize the drive, format it with NTFS and give it a drive letter. You will then be able to access the iSCSI drive as if it were another local disk on your computer. Bruce Mackenzie-Low is a master consultant at Hewlett-Packard providing third-level worldwide support on Microsoft Windows-based products, including clusters and crash dump analysis. With over 18 years of computing experience at Digital, Compaq and HP, he is a well-known resource for resolving highly complex problems involving clusters, SANs, networking and internals. He has taught extensively throughout his career, always leaving his audience energized with his enthusiasm for technology.